This post contains affiliate links. Please see the disclosure statement for more information. Day after day, you find yourself in the same routine. Wake up, get dressed, get your kids dressed, sometimes there is breakfast or a quick snack, and then everyone is out the door. You return home after 4:00 pm or 5:00 pm going straight into homework, dinner, baths, and bed. Maybe you’re able to sit down and have a quick “how is your day” chat with your kids or catch a few minutes for yourself. Most days it is all a blur. A few weeks of this and the working mom guilt starts to sink in. You might even dare to calculate the number of hours you spend with your family compared to how much you spend working. It gets overwhelming and leads you to even more guilty feelings. Has this ever been you? It has definitely been me. 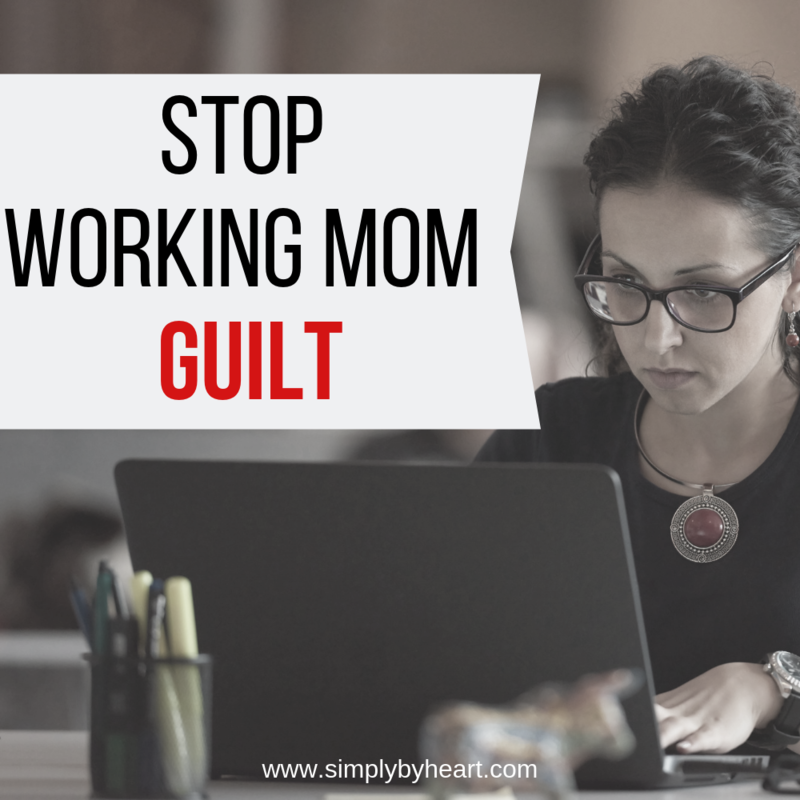 Let’s talk about how to stop that working mom guilt and take action to eliminate it. The first thing you have to do is accept the season of life that you’re in. Maybe this season requires you to focus more on productivity at work in an effort to reach the promotion that will bring in more income for your family. Or this could just be the season of life that has you spending the majority of your time driving one kid to multiple practices and tutoring another to improve their academic standing in school. Life is full of seasons. If you first accept that this will be temporary until something else needs your focus, it will help you lessen the feeling of guilt. We all do it. Maybe for a second, we think about a friend that posted their family vacation photos on social media and catch ourselves in a moment of jealousy. Yes, I said jealousy. That’s what it is. The thing is: we have no idea of the screaming fit that one of the kids had right before that photo or the amount of debt that family took on to pay for the flight to this flashy vacation destination. You don’t know that lady’s full life. This is one of those things that we just have to stop doing. Some of my favorite self-help/self-development writers would suggest flipping your thought to celebration instead of envy. Instead of looking at the moment to compare, take moment to congratulate them for having a beautiful family. Or use it as motivation to start planning your next family vacation. At the very least, you should click out of social media and go spend time with your family. You’ve most likely heard the analogy: you can’t pour from an empty cup. No? How about: self-care is not selfish. Maybe? Both of these phrases are 100% true. You can’t give your family the love and care that you think they deserve if you’re not loving and caring for yourself. Spending a few hours alone to run errands doesn’t count. Find some time to do something you enjoy. Take that Saturday afternoon nap! When I second guess myself on this one I ask myself one question: Do I want my family remembering me as the cranky mom that was always overwhelmed or as the well-rested mom that didn’t always have a spotless house? The latter gets my vote, every time. Every. Time. Take a few minutes and think of what you can do to fill yourself up or give you the energy to get through another week. Now schedule that thing on your calendar for next weekend. No excuses on this one. Make time for what is important to you. Having a change in your mindset could help reduce the feeling of guilt as a working mom. Instead of seeing it as not spending enough time with your kids, look at is as the opportunity for your kids to grow in their independence. Children spending time alone on their hobbies, or time away from family to develop friendships is an amazing thing. It helps them grow as critical thinkers, gives them a wider view of the world, and helps develop their problem-solving skills. Think about how much you are able to recharge after you’ve spent time with friends or done something for fun. Kids need to same opportunities. It is ok for them to be away from mom and dad as long as the environment is safe and supportive of their positive growth. If your primary feeling of guilt comes from the limited number of hours you spend with your family you have full control of that. Set aside one day each week to do something as a family for a few hours. It could be a weekly family walk around the neighborhood, family game night, or Friday family dinner at a local restaurant. The thing is that it has to be a priority for you. You don’t have to tell me, I know that having children in school and working full-time can be exhausting. However, you have to hold yourself to push past the exhaustion to do something with your family. Our family does this by spending a few hours doing something each weekend. I’ve even added in special trips with one of my children every other weekend to help them develop individual relationships with us. Going to the library, grocery store, or playing a game with family helps to check the box of family time and reduce the feeling of guilt. Better yet, it helps build memories of a family time that you can bring up when you begin to feel overwhelmed. Possibly, you will never be completely free of little feelings of guilt. It’s normal to feel so much responsibility for your children. I mean you did sorta create them. But, don’t let it get you overwhelmed. 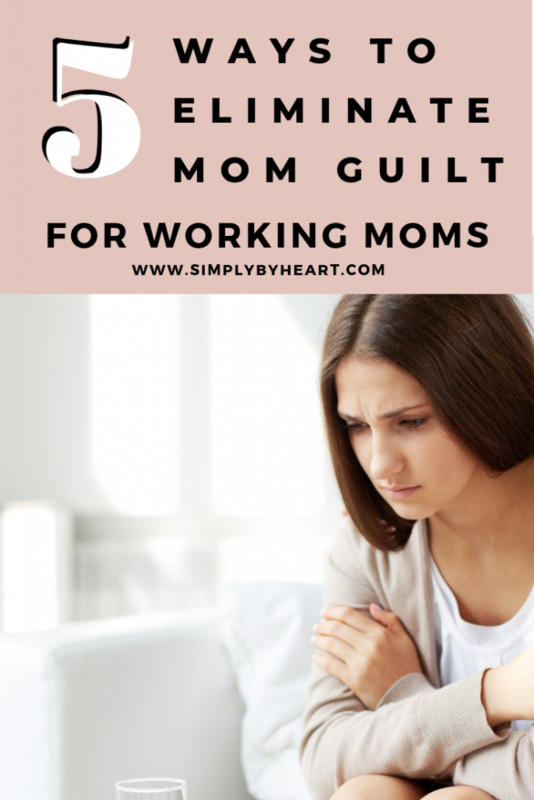 Take action when you start to feel guilty as a working mom and then let that feeling go. What actions do you take when you begin to feel guilty as a busy mom? Share it with us in the comments.